I recently found a sleepy Florida isle snoozing between the Gulf of Mexico and Sarasota Bay; one that rarely makes national news with the exception of 9/11/2001. President Bush was on island when the tragedy broke. Another story slipped onto the pages of USA Today naming the Mar Vista Restaurant as a top ten place to meet a millionaire husband. No surprise really, the average price of the 75+ private island homes stands at $827,000. Longboat Key rests in Southwest Florida, 20 minutes from Sarasota, surrounded by Caribbean blue water, miles of unspoiled beaches and yes, upscale lifestyle. But, fortunately you don’t have to be a millionaire to visit. 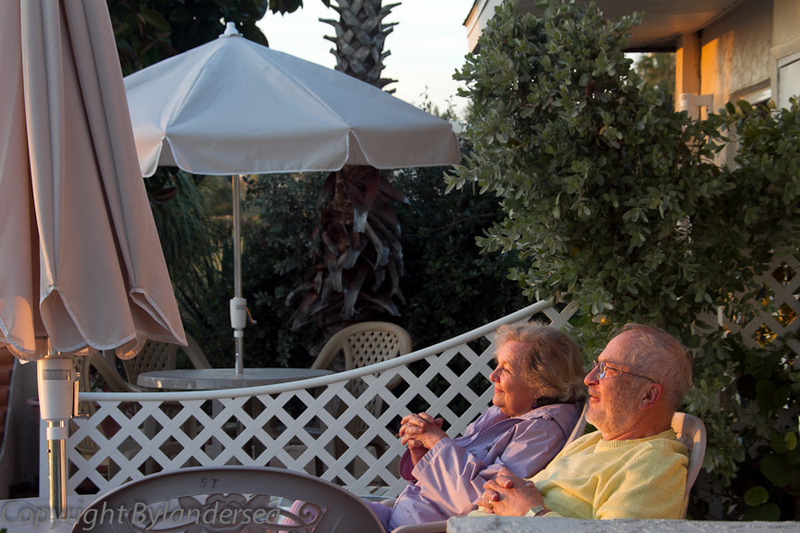 I arrived at the Sandpiper Inn and found a throw back to days of Old Florida vacationing. The lodgings offer 11 ground-floor studios, one and two bedrooms, with fully equipped kitchens and individual patios; all rooms are non-smoking. The Sandpiper snuggles a barbeque area amidst tropical gardens, yet sits close enough to the shoreline for ocean waves to be heard all night. 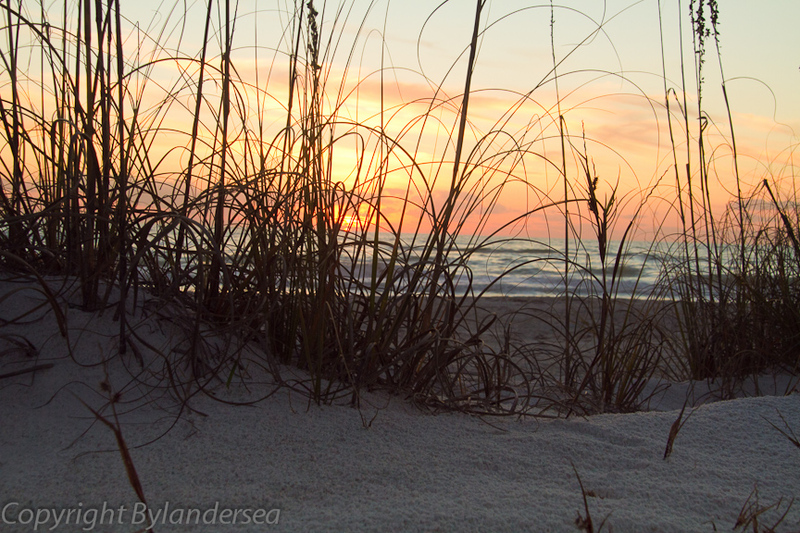 At daybreak, I merely stepped outside my room and started a beach walk. 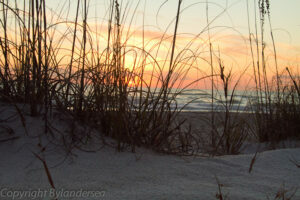 I huffed along as ribbons of lilac slipped into dawn and sand pressed between my toes. 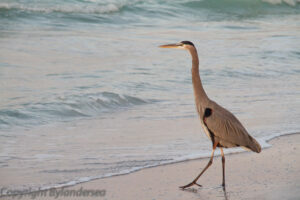 I exercised alone with my thoughts, a few shore birds and a blue heron. Late sleepers, I guess; no one appeared during the hour. Had I turned in the opposite direction toward the main thoroughfare, I could have fallen in the entrance to Euphemia Haye. The famed restaurant holds such a superior reputation that people drive 60 miles from Tampa for dinner. Being curious, I popped in their intimate upstairs bar one evening; found a cozy room with a masterful mixologist, comfortable seating, and seductive, live jazz. First class, indeed. Harry’s Restaurant lies further down the street, a tasty laid-back spot for breakfast, lunch or dinner or Harry’s gourmet take out (See previous post: I’m Just Wild About Harry.) Steps away stands the Backyard Bike Shop, providing rental bikes by the hour, day or week. Cycling remains the easiest way to get around the ten-mile long haven. Bike lanes are available on both sides of newly repaved main drive, which runs straight down the Key. 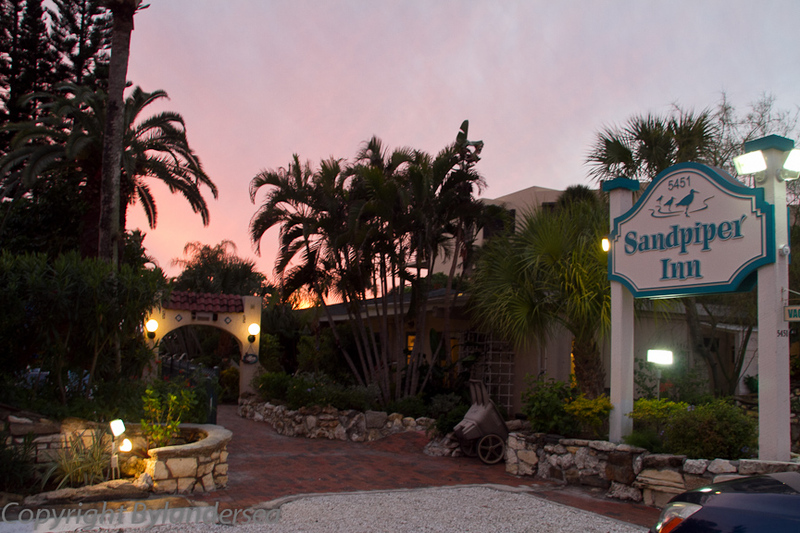 The Sandpiper Inn is not a B & B, they have an even better arrangement with the nearby Blue Dolphin Cafe. Guests receive a $25 voucher to spend on breakfast which is available any time of the day. Everything served at this locals hangout is prepared on premises by Culinary Institute graduates. The muffins alone are worth the trip. 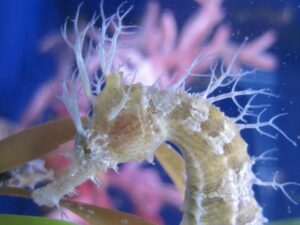 One of barrier island’s highlights is The Mote Marine Laboratory, a non-profit institution dedicated to marine research and conservation. Workers actively involved themselves with rescue and rehabilitation of animals during the recent Gulf disaster. Mote also farms sturgeon for the marketplace and fine restaurants. Historically, the fish prized for its caviar was depleted in the wild. Mote developed the ability to clean and re-use water efficiently while raising the seafood. The renown Mar Vista Dockside Restaurant was built in 1912 with rusticated concrete blocks made onsite. 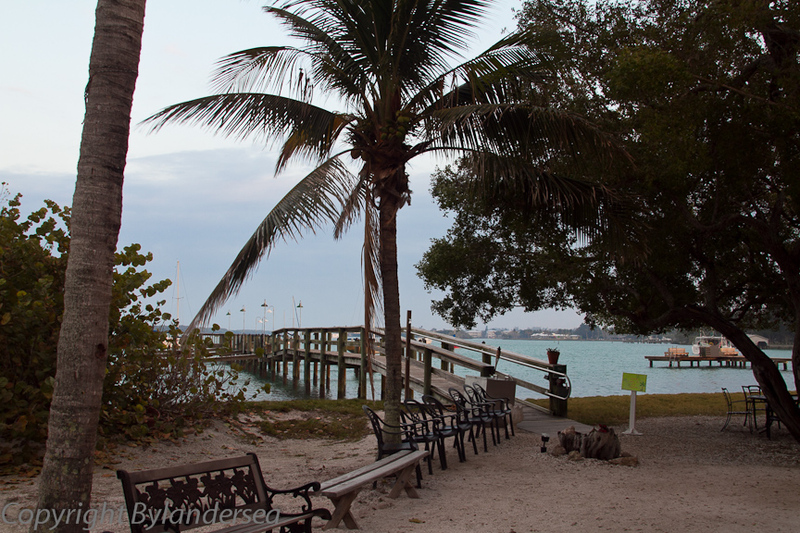 The original house section is considered one of the twelve oldest surviving structures on Longboat Key. Guests arrive by car or boat, tying-up at the pier. They dine at water’s edge outdoor tables below gnarly old Buttonwood trees or on a covered deck. 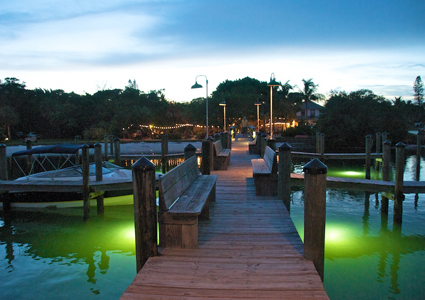 The bayside pier glows in the evening with gorgeous underwater lights. Seafood and steamer pots containing Snow crab, Dungeness crab, shrimp, mussels, and Maine lobster tails are the house specialty. Must say, my margarita rated top-shelf honors. Sarasota considers herself the cultural capital of Florida and little Longboat Key has its own Center for the Arts. Here, residents and tourists find classes and concerts plus a lecture series in conjunction with the Historical Society. Tom Aposporos , President of the Chamber of Commerce had reason to beam about a recent award. 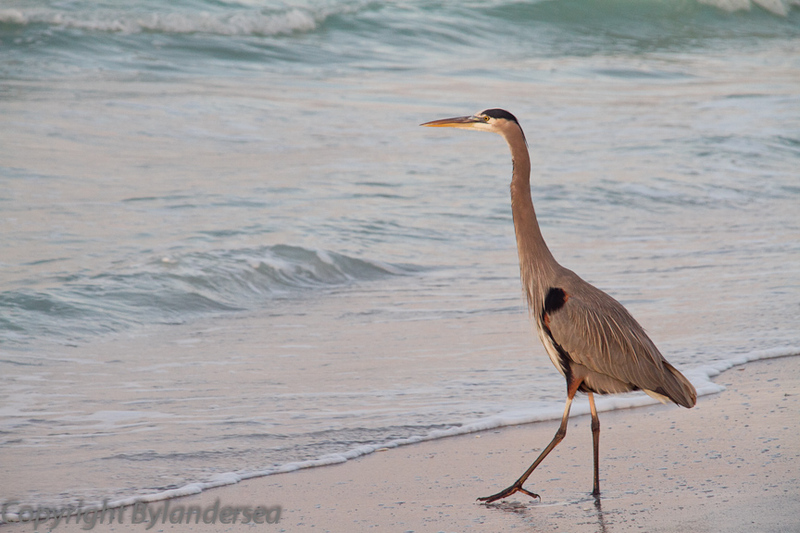 He said, “In 2010, Conde Nast Traveler magazine readers ranked Longboat Key number two for best island destinations in North American.” Okay, that’s a mouthful but just think, the isle beat out Vancouver Island in Canada, Key West and Nantucket. In case you are wondering, Kiawah Island, SC took the top spot. By the time I left the Key, I was more than satiated from irresistible restaurant offerings. I eased into total relaxation; found getting around easy and the sea air intoxicating. LBK is an ideal place to kick off your shoes and savor the sunshine. More adventurous can kayak through canals and mangroves, bike in safety, tennis, golf or fish. 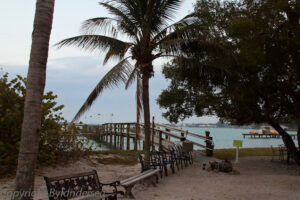 Little wonder most guests stay a week and snowbirds return year after year. I can’t wait to go back myself, and I’m a Floridian.